Mid week weddings are becoming increasingly popular which now means that I am asked to photograph weddings on any day of the week, whereas in the past weddings were traditionally held on Saturdays. This is great for all businesses associated with weddings not only wedding photographers but also wedding venues with accommodation, wedding flowers, wedding cakes, wedding hair stylists and wedding make up artists to mention just a few. Cornwall is more easily accessable especially in the busiest holiday times during the week. The M5 motorway and A30 do not suffer from quite the same gridlock as happens at the week ends as most people tend to holday from Saturday through to Friday. Having a mid week wedding may be much more convenient for couples and their guests as travel is easier. People often need more time to be able to plan time off in advance so it's a good idea to get your wedding invitations sent as soon as you can. Many people work shifts with companies operating 7 days a week so it may well be easier to get time off as often week ends are particularly busy for many businesses. Great weather is available all week long and this helps make your wedding that bit more special especially for your wedding photography. 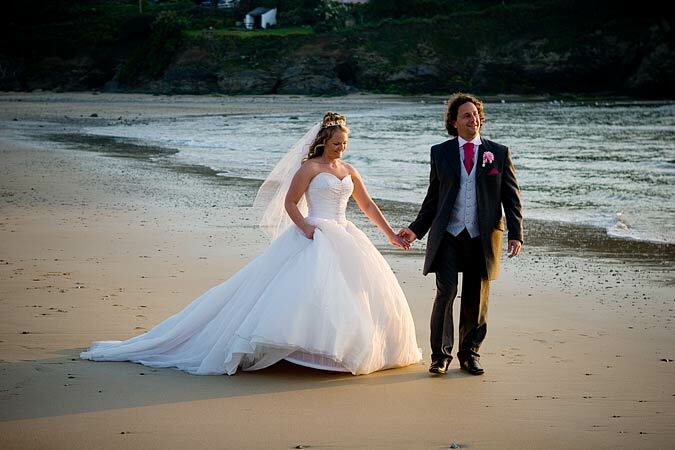 I am thrilled to be a recommended wedding photographer by many venues in Cornwall. I photograph many week day weddings ie weddings that take place on Monday to Friday. Not only do the venues benefit but so do places offering Bed and Breakfast of which there are many. This is often a good option for wedding guests with many booking a hotel stay for the night of the wedding and then moving to bed and breakfast accommodation for the remainder of their stay. Please note that many of the hotels licensed for civil weddings provide special rates for weddings guests so if a wedding venue has leisure facilities it may well be worth staying so you can enjoy relaxing swims before breakfast. Brides you now have total freedom to choose the day of the week you'd like to get married.